My own reaction was pretty much the same when I first saw Alassari Plantation’s website. Lush mountain rainforest with sunbeams and waterfalls. Layers of emerald rice terraces glinting in the crystal clear sunshine. Gleaming Javanese wooden villas furnished with leather sofas and big screen TVs. A pool with a view of the next door volcano. A bamboo spa in the rainforest. It all looked alluring, and very special. I’d never heard of Alassari Plantation before, which was no surprise, since it had only opened a few months earlier and was still very new. Another friend in Ubud had sent me the link when I was looking for unique places to stay in Bali. This was a different friend from the one who had told me about the secret honey house Villa Madu. Thank goodness for friends who are plugged in and switched on. (Thank you secret friends, you know who you are!). 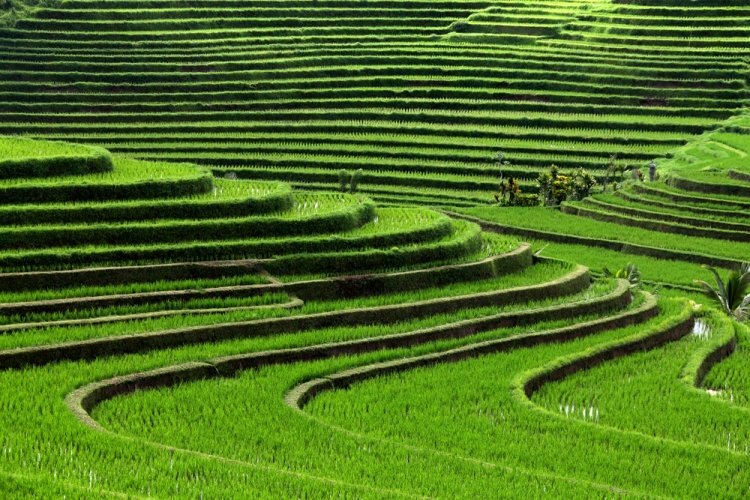 My friend (and the website) told me that Alassari Plantation was in Bali’s Tabanan district, the area where all the most gorgeous rice terraces are located. I hadn’t been to this part of the island before and couldn’t wait to see something new. Besides, downtown Ubud with its increasing congestion, tourists and chaotic traffic was getting overwhelming. It would be good to get far from the madding crowd. Alassari owner Craig offered to send a car to pick us up from Ubud, but we decided to drive up ourselves, which allowed us to ramble through picturesque villages, drive around in circles trying to find our way and pester bemused locals like the clueless village boy, the fried chicken guy, the granny with the basket, and the motorcycle guy for directions along the way. View of the lawn and pool from the dining room. We arrived at Alassari in the early afternoon (having stopped for lunch of succulent babi guling roast suckling pig in a village along the way) to be greeted with a warm welcome by the charming Australian owners Craig and Valarie, who hugged and kissed us with enormous warmth, as if we were long lost friends, even though we’d never met before. Actually it was Valarie who I met first while I was standing in the terrace dining room admiring the view. She suddenly appeared and lit up the room with her beauty and elegance. Her whole being radiates happy energy, and even though she’s in her 60s, has the most incredible posture I’ve ever seen and looks much younger than her age. “Wow. You are insanely fit!” I couldn’t help blurting out. No wonder. Val was a former ballerina who had danced all over Europe, then owned fashion boutiques in Australia in her previous life before meeting and marrying businessman Craig. The couple came across this beautiful location in Bali and together they created Alassari Plantation. Craig was just as friendly in person as he was in emails. Gregarious and knowledgeable, he loved sharing all sorts of stories and insights about flora, fauna, people, spirituality, life lessons, and all kinds of stuff. He kept us entertained listening to stories about life at Alassari, and life in general. My comfortable bedroom in Villa Tiga. I love the fluffy bed. Alassari Plantation features five luxury villas comprised of Javanese traditional wooden houses, each one different. I was in Villa Tiga (meaning number three), which was the biggest, with separate living room, bedroom, and bathroom. The best part was the long balcony running the length of the villa with three separate sitting areas including a dining table . The luxurious bed and all that soft bedding were fabulous to sink into and gave me a great night’s sleep. Alassari is eco-conscious and uses only sustainable bamboo fibre bed sheets and linens. I loved the thoughtful luxury details – San Pellegrino sparkling water in the mini bar fridge, an espresso machine, both thick terry bathrobes and light cotton dressing robes, and the soft fleece blankets on the bed that were perfect for adding extra fuzzy warmth when the night got chilly. Charming little baskets of flowers decorated the beds, coffee tables, and bathroom. I loved finding these little baskets everywhere. Each basket had a different arrangement of different leaves and flowers. Yoga classes are available in the open air bamboo yoga shala. The spa nestles underneath it, overlooking the gorge. A new bamboo guest villa called the Harmony Tree House was underway at the time of our visit, accessible by crossing the fabulous suspension bridge that Craig built. Craig took us on a long, winding walk to show us the property. The natural jungle here is lush and primeval, with fantastic trees and ferns that look Jurassic in size and majesty. I love ferns and leaves and loved the variety to be found here. The suspension bridge is the highlight of a walk around the grounds. The bridge brought us right up close to the tops of towering palm trees and cascades of palm fruit, while looking down we could see the tops of spectacular tree ferns, which are (guess what) ferns that grow to the size of trees. Huge clusters of palm fruit cascade off the trees. Bella the border collie joined us and happily trotted by our side as we followed the path down to the stream below where a series of waterfalls gushed into a natural pool. This is where they used to swim before the swimming pool was built on the hilltop, Craig told us. He also told us all about the irrigation system of the rice fields and how the local villagers manage water. Winding paths and stone stairs ramble all around the hilly property and are lined with dozens of alcoves occupied by myriad little Buddha figures. Craig told us that the previous owner had found a Buddha shop that was going out of business, bought the whole lot and stuck them all over the grounds. The path we were on was called Buddha Walk. The coffee bushes covered the whole hillside, along with an organic garden which produced vegetables for the kitchen. Purple bananas grow all over the plantation. Beautiful but inedible. And yes, they really are purple. We tried out the relaxing oil massages in the Bamboo Spa, located underneath the yoga shala. 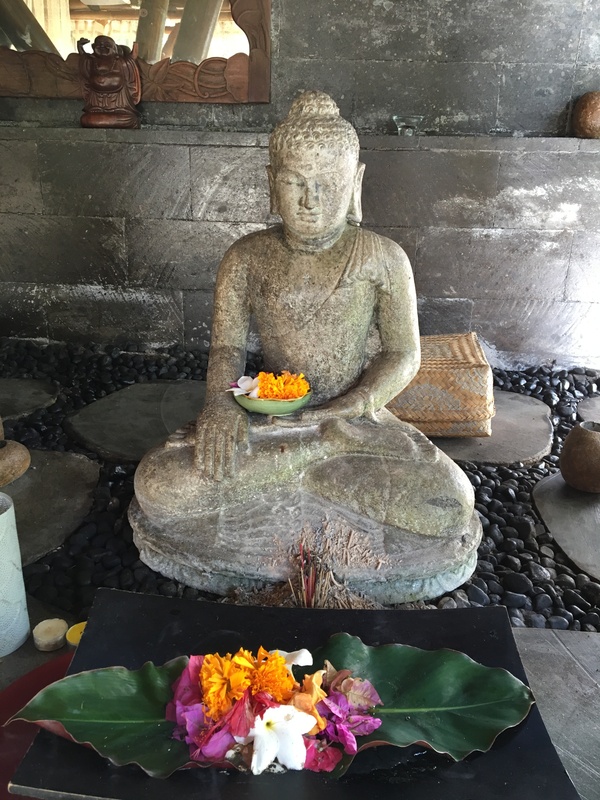 Massages are administered by sweet therapist Ria, who used to work at a luxury resort in Seminyak and can do Ayurvedic yoga massage, Thai massage, and hot stone massage, among others. Craig and Val live next door in a magnificent Javanese house that was a royal house. It looks very royal, completely covered in exquisite carvings, with a deep verandah in front where their five dogs like to hang out. At the time of our visit, they had collected a new group of pets-in-waiting. They’d found a colony of Atlas moth caterpillars in the bushes, which had turned into chrysalises. Atlas moths are the biggest moths on the planet, and can grow up to the size of a dinner plate. Craig told us the whole life cycle and reproductive history of the Atlas moth. There were 80 chrysalises, and Craig and Val had adopted a few and kept them in their bedroom strung across their canopy bed waiting for the new moths to emerge. It looked kind of scary to me. I’m afraid of crawly things. “Err, aren’t you afraid you might wake up and find yourself in a Hitchcock movie with things flapping everywhere?”, I asked Val, nervously eyeing the moth chrysalises strung above their bed. No. Not at all! A giant furry Atlas Moth emerges from its chrysalis in all its glory. While wary of the moths, I was more attracted to a lovely antique crib filled with this adorable collection of old teddy bears. The bears had belonged to Val’s five sons, and might be to passed on to the next generation one day. The plantation is located on top of a hill, so it gets wonderfully chilly at night, which was a welcome respite from the sweltering heat of Ubud. I was expecting the chill and was looking forward to it. View from the restaurant, stretching all the way down to the sea. What I hadn’t anticipated was the fantastic view from the top of the hill. From the dining room, the vista stretches from the next door volcano, Mount Batu Karu, all the way down to the coastline and across to Lombok Island. We could see the afternoon sun glinting on the sea and the dark hills of Lombok beyond. What an amazing sight! We were sad to leave cool, peaceful Alassari Plantation and our wonderful new friends Craig and Valarie when it was time to check out. However, the drive back to Ubud made up for having to leave. The surrounding area of Tabanan is the stuff of travel videos and postcards. The natural beauty here is breathtaking. Unreal, even. After returning to Ubud from Alassari, I felt a distinct difference between before and after the visit. I returned with more energy, feeling revitalized, rested, and refreshed. I’d been hearing a lot lately about “forest bathing” or shinrin-yoku, a Japanese practice which entails recharging your energy and releasing stress by walking among a living forest of trees and nature. And it must work, because the visit to Alassari happened to be my own unintentional experience of forest bathing. No wonder Craig and Val are so radiant and alive. They’re absorbing all that good energy from the luscious rainforest which is their beautiful home. Have you stayed at a rainforest resort before? How was your experience? Yes it is! The owners Craig and Val make it such a wonderful experience too!